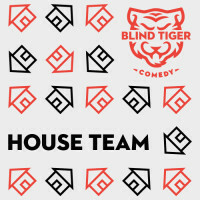 Blind Tiger Comedy is committed to welcoming a diverse range of voices, perspectives, and people into our community. 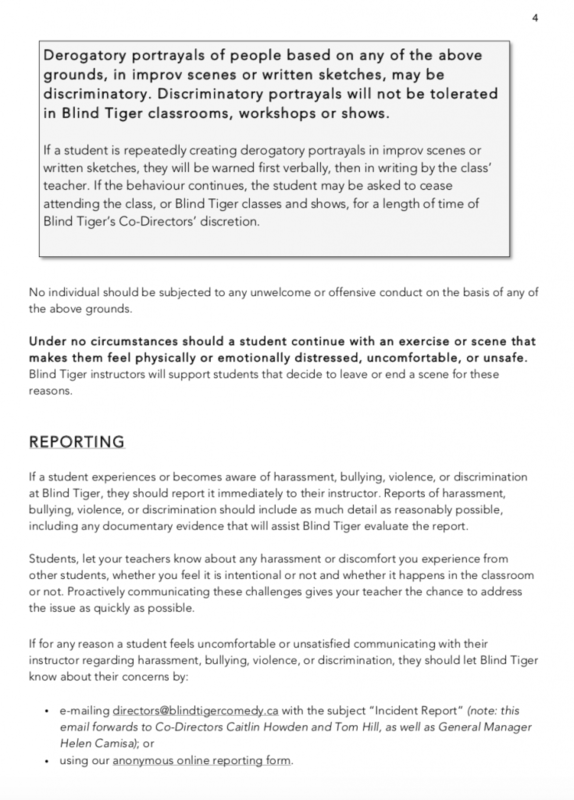 Meanwhile, harassment – be it verbal, sexual, physical or otherwise – is absolutely not tolerated at Blind Tiger Comedy classes, events, or rehearsals. While not directly related, we feel addressing both these topics is critical to creating as safe a space as possible at our school. These efforts are evolving and we acknowledge we are learning as we go. We welcome your feedback at directors@blindtigercomedy.ca. Let’s talk! 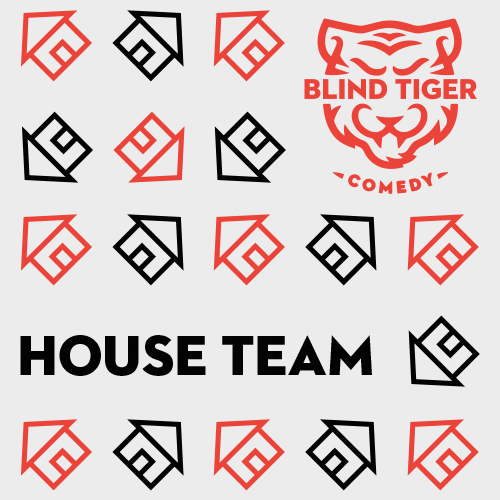 Blind Tiger Comedy (BTC) is dedicated to increasing the representation of people of different ethnicities, genders, sexual orientations and abilities into Blind Tiger Comedy’s classes, shows, and the Vancouver comedy community as a whole. BTC’s Diversity Scholarship is available to people of colour, members of the LGBTQ2+ community, and differently abled people. The details of this scholarship are subject to change as we learn and receive feedback about this programming. The BTC Diversity Scholarship makes four Intro 1 classes available to people of colour, members of the LGBTQ2+ community, and differently abled people each semester (roughly January – March, April to June, July to September and October to December). In addition, four non-Intro 1 classes will be accessible via this scholarship each semester. 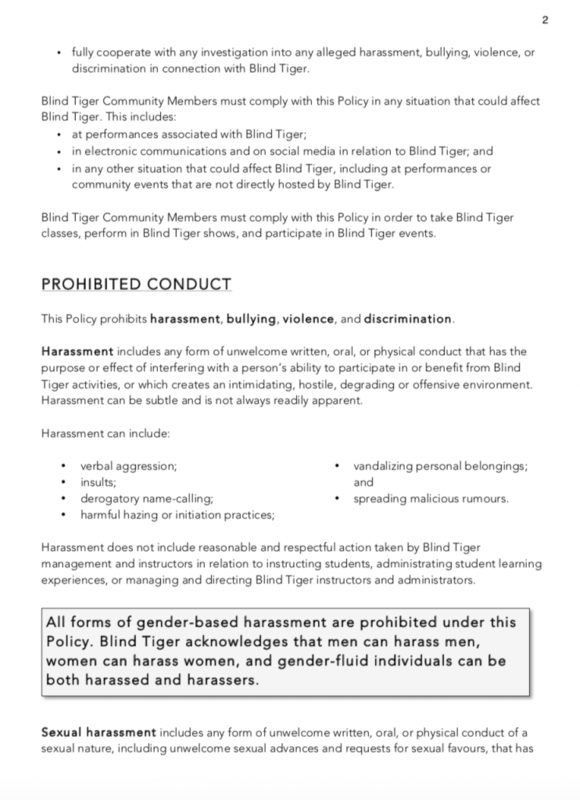 The BTC Diversity Scholarship is not explicitly need-based though we ask that applicants be mindful of their need when considering applying so that the scholarships may be given to those who might not otherwise be able to take classes at Blind Tiger Comedy. BTC would like to acknowledge that some of the spaces they teach are lacking in terms of accessibility. While recents efforts have been made to improve these drawbacks, individuals should contact the school to confirm what their needs are so they can be best supported. We have endeavoured to make the application process as light as possible, however there is no way around needing some information from applicants. Thus, to apply, we ask that you fill out this four question application. Applicants will be accepted on a first-come, first-serve basis, with the exception of those applying who have already received a scholarship. Preference will be given to new students, therefore students who have received a scholarship and are applying again (welcome back!) will be contacted closer to when the semester begins. Applicants will be contacted by BTC faculty at least a week before each semester begins. Blind Tiger Comedy would like to acknowledge the work of other great theatres and communities have done developing programming like this, and specifically some of the language used in our programming, particularly HUGE Theater, Bad Dog Theatre, and Rapid Fire Theatre. On Friday, March 1st, 2019 Blind Tiger Comedy will host its third POC Night. 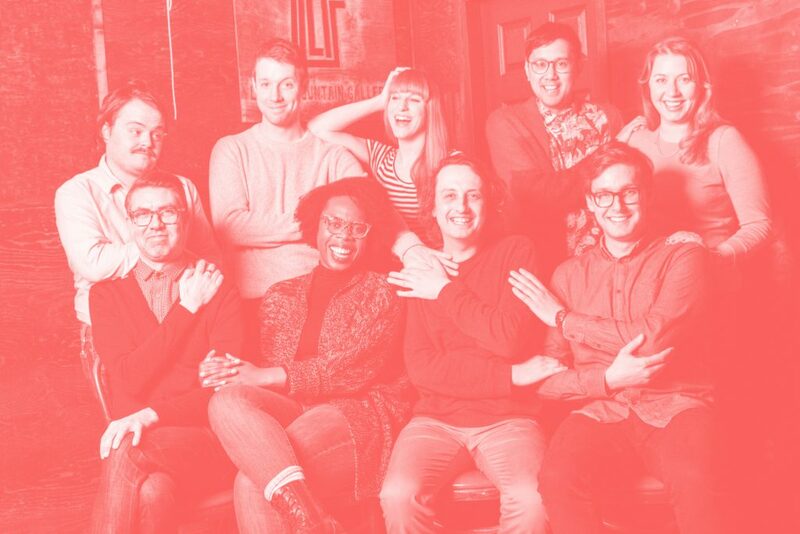 At 6pm, Blind Tiger Comedy faculty Ese Atawo will teach a free one-hour free improv class. From 7:30-8:30pm, it’s our first ever POC Jam! People of colour from across the Vancouver comedy community are welcome to come jam, no experience required! To reserve your free spot in this jam, register here! The free improv class and jam show are exclusively for people of colour, though everyone is welcome to watch the jam at 7:30. Blind Tiger Comedy is committed to running at least one POC Night every six months. The next WTF Night will be during Semester 23 (July-September 2019). Every six months, Blind Tiger Comedy hosts its a WTF (Women Trans Femme) Night. WTF Night aims to provide a safe, supportive environment to dig into improv/ comedy exclusively for those who identify as female, transgender, femme, genderqueer, trans-masculine, trans-feminine, or feel that their socialization or treatment as a woman, transperson, or femme has impeded their participation in improv. This free drop-in class and jam are reserved for WTF performers. No experience required. Blind Tiger Comedy is committed to running at least one WTF Night every six months. 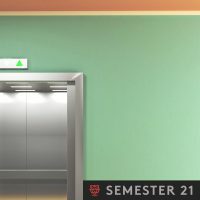 The next WTF Nights will be during Semester 22 (April-June 2019) and Semester 24 (October-December 2019). Improvisers interested in BTC’s WTF Night may also be interested in our Women Centre Stage class, which welcomes all people who identify as women, or identify with the experiences/struggles/strengths of womanhood and focuses on making strong offers, embracing unique voices, and taking agency on any stage. 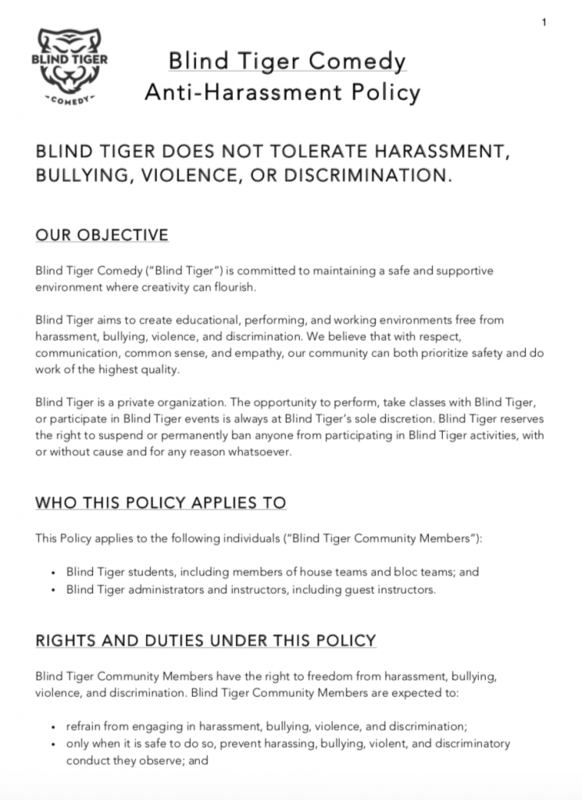 Blind Tiger Comedy does not tolerate harassment, bullying, violence or discrimination. 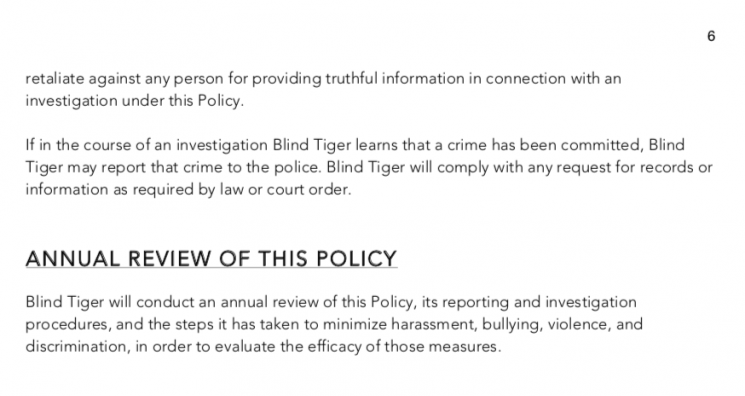 In order to take a class with Blind Tiger Comedy, you must read and agree to the policy below, which you can do here. 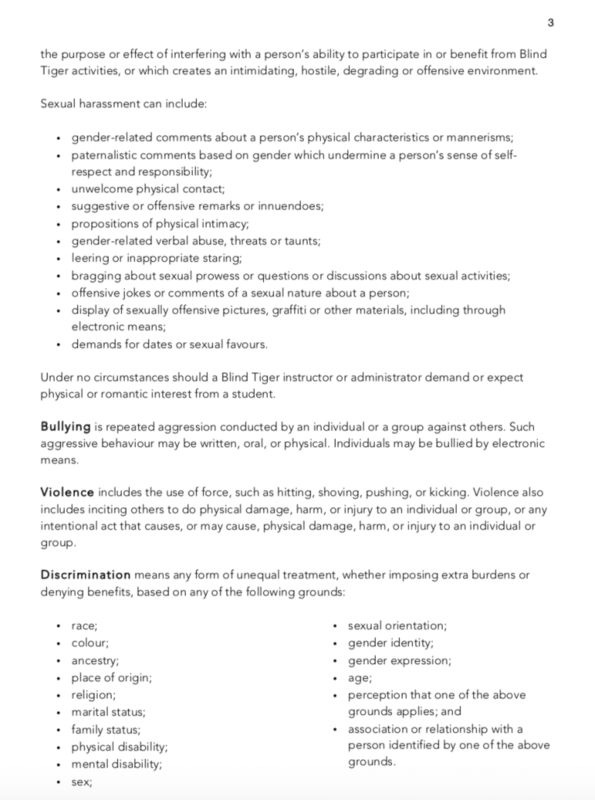 We welcome your feedback about our Anti-Harassment Policy or any of our programming via directors@blindtigercomedy.ca. We see our efforts to make the Vancouver comedy community as safe as possible as part of an ongoing effort, not a one-step process, and will strive to learn and improve our efforts as we go. If you are a student or other member of the Vancouver comedy community, and would like to use our anonymous harassment form, click here. 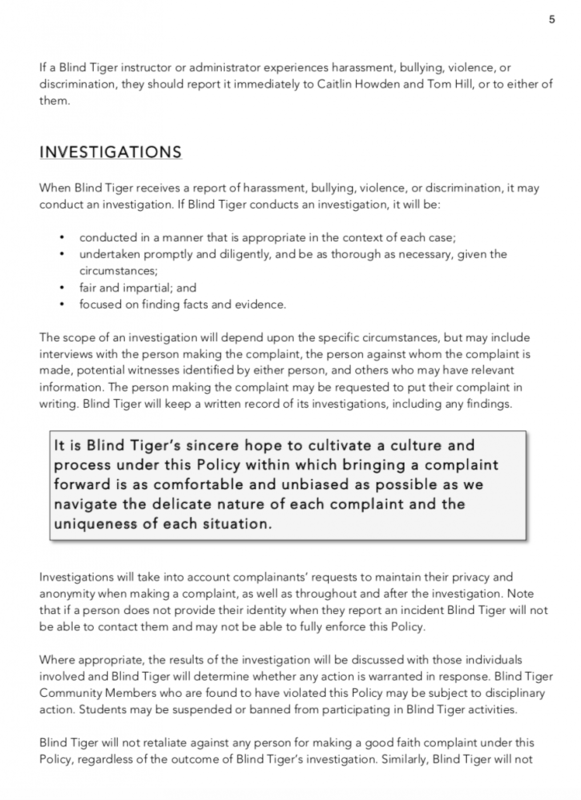 Note that the form does not disclose your name, but that anything written in the form will be read by Caitlin Howden and Tom Hill, Co-Directors of Blind Tiger Comedy, as well as Helen Camisa, General Manager of Blind Tiger Comedy. Submit your financial aid application here. We get that applying for financial aid can be stressful. We’ve tried to keep the application as short and unintrusive as possible. Every member of the Blind Tiger Comedy team has experienced significant financial need, and that’s why this scholarship is important to us. Financial Aid Applications for classes starting April 6 and beyond are due March 30, high noon PST. If applications come in after this time and there are still scholarships available, we’ll take em! The form will be closed as soon as we’re filled for this semester. Following that, the form for future classes will open, with a specific deadline after which the applications will be reviewed. As always, we welcome your feedback on this programming via directors@blindtigercomedy.ca. Thank you in advance for your time!